Biscuits – o frabjous day! These are lovely spiced slightly crunchy gingerbread biscuits, adapted from a classic recipe in The Joy of Cooking. 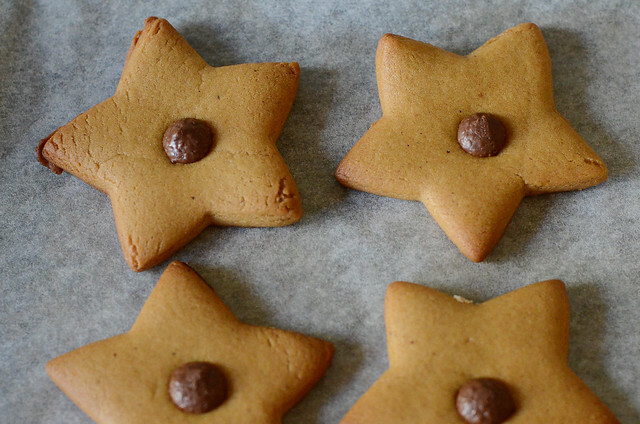 They’re great to make with children – the dough is easy to mix up, it involves melting butter in a saucepan (a big plus according to my four year old), they can press shapes out of the dough, and then decorate the resulting biscuits. In a small saucepan, melt together the butter, sugar and golden syrup or molasses until the sugar is just dissolved. Remove from the heat to cool until just warm. In a bowl, stir together 2 1/4 cups of the flour, the baking soda, salt, and spices. 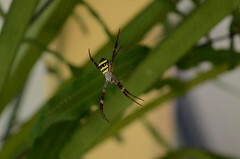 Make a well in the centre, and pour in the melted butter mixture. Stir vigorously to blend together. Gradually add in the remaining 1/4 cup of flour. The mixture should now be a ball of smooth dough, pulling away from the sides of the bowl. Remove the dough from the bowl and knead it a few times, before flattening it into a thick disc and wrapping it in plastic wrap. Put it in the fridge to cool down for 20 minutes or so, so that it’s easier to roll out. You can also leave the dough in the fridge at this stage for up to four days, returning it to room temperature before you roll it out. (You could presumably also freeze it and then defrost before use, but I haven’t tried that). Preheat the oven to 180C, and roll out the dough to around half a centimetre thick. (Yes, I did actually get out a ruler and check this, although I never manage to roll out dough evenly anyway. Mine always end up being varying thicknesses, which doesn’t seem to matter all that much). Cut out your biscuits in whatever shape you desire (and if you’re cooking with a four year old, let them artistically place chocolate bits where appropriate). Depending on the shape you’ve chosen, this amount of dough should make between two to three trays of biscuits. 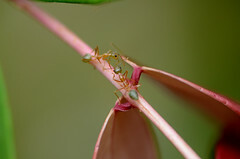 They don’t spread much at all, so you can place them close together. Bake the biscuits for about 8 minutes, until they’re just starting to brown on the edges. They’ll firm up as they cool down, and they’re easy to overcook (although that just makes them extra crunchy). When cooled, they can be decorated with icing, but it’s not necessary. They taste great plain, and keep very well in a sealed container for at least a week. 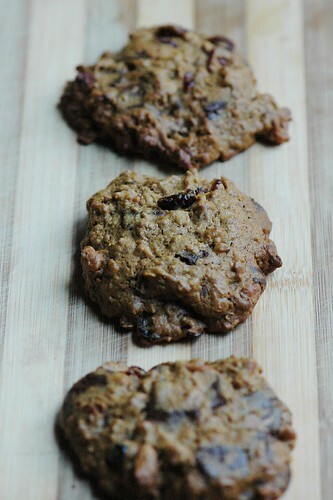 This is a recipe from Dan Lepard’s Short and Sweet which is actually entitled “Dark Chocolate Chunk Cookies”. I know this is much more alliterative than my version, but saying “cookies” makes me feel un-Australian. Biscuits it is. They’re extremely chocolatey and rich and magnificent. Lepard suggests using them for ice-cream sandwiches, but honestly despite my extremely sweet tooth I think that would be overkill. They’re pretty great as an accompaniment to coffee, though. The original recipe calls for 300 grams of dark chocolate. I reduced this to 200 grams because that was what I had in the cupboard, and I think if I used 300 grams there would have been more chocolate than dough. That’s not necessarily a bad thing, of course; sometimes one is in the mood for a biscuit that consists mostly of chocolate. They turned out perfectly well with the reduced amount, so you could probably add chocolate chunks to taste without anything too terrible happening. I presume the 25g of caster sugar is doing something vital texture-wise, otherwise I’d be tempted to leave that out as well just so you don’t have to haul two types of sugar out of the cupboard. Preheat your oven to 170C or 150C fan-forced. Beat the butter, sugars and vanilla essence together until smooth and creamy. Beat in the egg until well combined. Either sift together the flour, cocoa, and bicarb in a seperate bowl and stir them into the butter mixture (per the original recipe); or measure them out on top of the butter mixture, refrain from sifting, then stir it all together. I promise the lazy method works perfectly fine. It mixes together into a fairly stiff dough, and is consequently too difficult to stir with one hand while holding a baby. You will have to put the baby down and manically sing to her while stirring the mixture frantically. The things we do for biscuits. 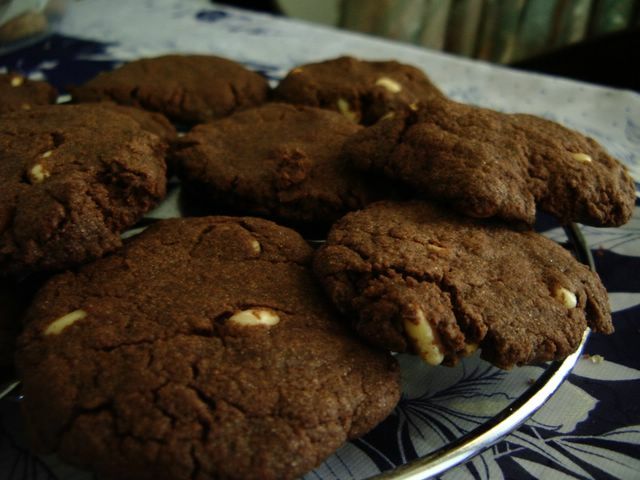 Stir in your desired amount of chocolate chunks with a firm and unyielding hand. Disabuse your three year old of his fine notion that we are putting one piece of chocolate in our mouths for every piece that goes in the bowl. While grinning entertainingly at your grumpy infant, scoop up tablespoonfuls of the dough, roll into balls, and place on lined baking trays about 4-5cm apart. This makes around 18 or so biscuits. Bake for around 12-14 minutes – the biscuits should be just firming at the edges and be a little puffed up. Let cool for a few minutes then transfer to a rack. Enjoy with coffee or tea, or possibly sandwiched together with ice-cream if you’re feeling particularly sugar deprived. This is another recipe from Annabel Crabb’s Special Delivery cookbook. These are fairly sweet and more of a gift biscuit (in keeping with the theme of the cookbook) than an everyday sort of biscuit. You should be able to substitute any combination of dried fruit, nuts and chocolate you like – the original recipe uses white chocolate chips with the apricot and macadamia nuts, but I am a little disapproving of white chocolate so I used dark, which worked really well. 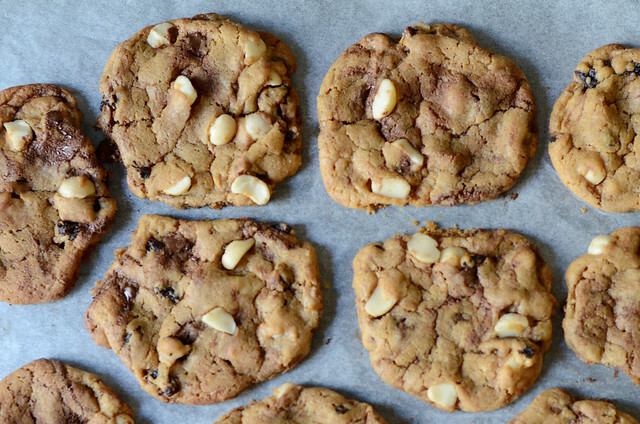 They’re wonderfully chewy and the apricot and macadamia combination is delicious. Melt the butter and brown sugar together in a small saucepan and let it cool down a little. Preheat the oven to 180C. If you are in favour of sifting flour, then sift the flour and baking powder into a mixing bowl. If you’re me and unconcerned with such niceties, dump the flour and baking powder into a bowl and give it a stir. Add the caster sugar. Pour in the slightly cooled butter and brown sugar mixture, and stir the mixture well. Stir in the beaten eggs, vanilla, apricots, macadamias and chocolate chips. Line two trays with baking paper, and then scoop out 3cm-ish balls of the mixture, pressing them onto the trays. I used a coffee scoop which seemed to work well. Bake the biscuits for about 10-12 minutes, depending on how big your biscuits are – when they’re set on top, they should be fine. If you want them more crunchy than chewy, leave them in for a minute or two longer. When a recipe has equal amounts of butter, cheese and flour, you know the result will taste good. 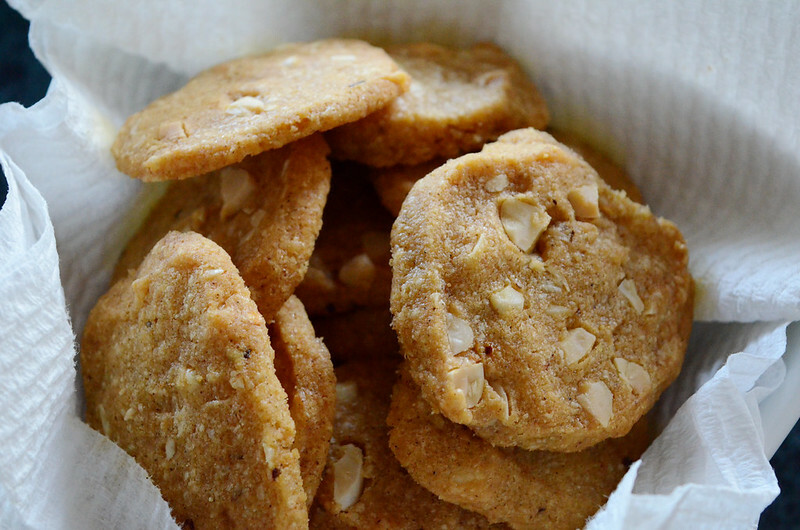 These spicy cheesey biscuits are lovely, crisp salty little snacks speckled with the pleasant contrast of the almonds. Haul your food processor out of the high cupboard where it’s stored. Roughly chop the butter into the food processor, add the cheese, chilli flakes, salt, paprika and crushed garlic, then let it whiz around for about a minute. Add in the flour and cold water, and keep whizzing away until you have a soft dough. Take it out of the food processor, and stir in the chopped almonds by hand so they don’t get too crushed up. Get two sheets of baking paper, and spoon half the mixture onto each one. Roll them up into log about 4cm thick and 20cm long, and put them into the fridge or freezer until the dough is fully firm. Heat up your oven to 180C (about 170C if fan forced). Cut 1cm thick slices off the dough sticks, and put them a few cms apart on lined biscuit trays. Bake for about 25 minutes, until golden, then slide the biscuits onto a cooling rack with a spatula. 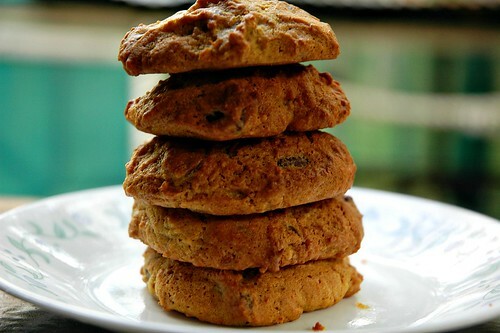 Chewy wholemeal biscuits studded with cashews or dates – or whatever combination of dried fruit and nuts you prefer. 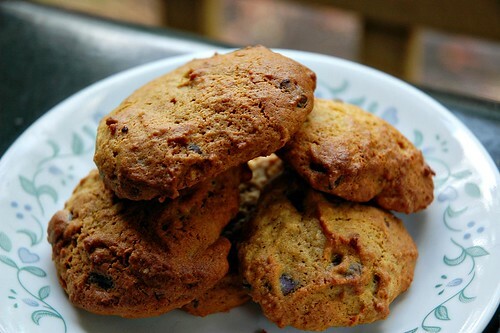 I adapted them fairly heavily from Dan Lepard’s blueberry choc chip cookies. Next time I think I’ll reduce the sugar a bit even more, or use one of those less sweet alternative sugars, like coconut sugar. 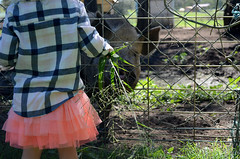 It was a good toddler-baking-assistant recipe – plenty of stirring involved. Heat up your oven to 170C (or 160C if it’s fan-forced). Chop up the nuts and dried fruit. Beat the butter, oil and sugar together with a spoon until smooth, then beat in the egg and vanilla extract. Add the flour, bicarb and salt, beat it in well, then stir in the dried fruit and nuts. It mixes up to a fairly damp dough. Line two biscuit trays. Scoop up spoonfuls of the biscuit dough and roll them into rough 2-3cm balls. Pass the balls to your toddler, and tell him or her to press them gently onto the biscuit tray. This instruction will be ignored. You may need to uncompress some of the biscuits a little before baking them for around 15 minutes, until they’re just started to brown at the edges. They’ll firm up as they cool, and you can transfer them to a cooling rack after 10 minutes or so. This recipe is originally by Dorie Greenspan, from Baking From My Home to Yours. I found it on Popsicles and Sandy Feet and made some slight variations due to the ingredients I could get hold of (and to leave out the dried coconut, because I’m not a fan). It’s a lovely chunky biscuit that’s so variable – the recipe calls for a cup of dried fruit and a cup of nuts, and there are so many different flavour combinations you could try. Over at Popsicles and Sandy Feet, Mary has detailed six different combinations she tried. I ended up using dried cranberries, pecans and 70% dark chocolate. The original recipe calls for two cups of chocolate chips, but I think (astonishingly, given my love of chocolate) that it’s too much, with all the other additions to the mixture. I cut it down to one, and I think the results are marvellous. 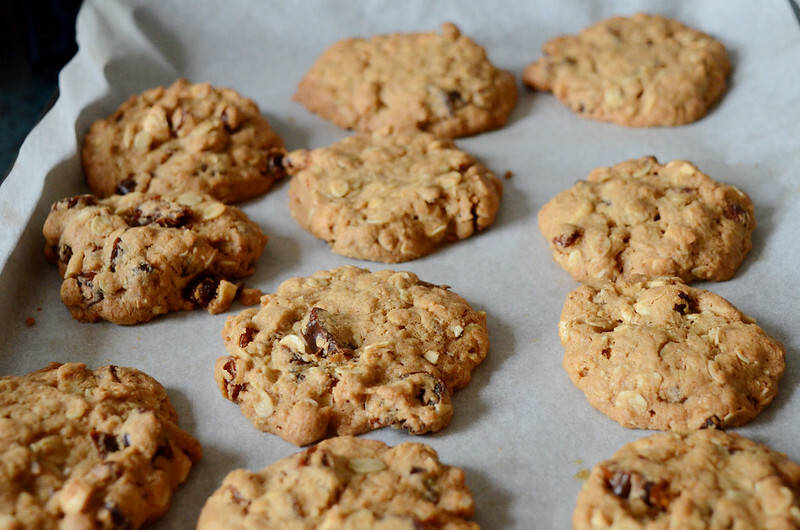 Chewy, oaty, fabulous cookies. Preheat the oven to 165 C. Line your baking trays with baking paper (or, if you’re me, roughly tear off two sheets of baking paper and lie them on top of your trays, not bothering to stick them down with anything). If you’re a more focussed cook than me, whisk together the flour, baking powder, baking soda and salt. Using a hand mixer (or a stand mixer if you’re fancy), cream the butter and sugar together for a couple of minutes. Pour in the treacle and beat for another minute. Add the eggs one at a time, beating after each addition. Mixing on low, pour in the oats, and then add the dry ingredients you’ve whisked together (or, if you’re me, pour them all separately into the mix at this stage), mixing only until combined. Toss in the nuts, fruit, and chocolate and stir together with a spoon until they’re mixed through. Apparently you can wrap the dough and chill it for up to two days at this stage, however I baked it right away. Spoon the mixture onto baking trays – the original recipe calls for an icecream scoop with a two tablespoon capacity – I used a heaped dessert spoon. Plonk your spoonfuls of mixture onto the trays (apparently about 1.5 inches apart – I never pay any attention to strictures like that and generally place things where it looks right. 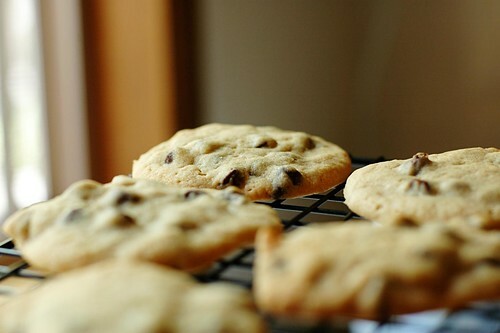 Sometimes this works, sometimes it doesn’t) and bake for about 15 – 18 minutes, until the cookies are golden and just set. Leave them to cool on a baking rack. I’m looking forward to trying another variation on this – with raisins and salted peanuts, which sounds intriguing. These chocolate chip cookies are lovely – crisp on the outside, chewy on the inside, and lots of chocolate chips. Recipe from Smitten Kitchen, home of so many awesome baked goods, and only slightly altered. Pre-heat the oven to 160C. Sift together, if you’re into sifting, or simply stir together the flour, baking soda and salt into a small bowl. In a large bowl, cream together the melted butter and sugar, then beat in the vanilla and eggs. Fold in the flour mixture, until just combined, then gently stir in the chocolate chips. Cover baking trays with baking paper, and spoon out the mixture a tablespoon at a time with a little room for the biscuits to spread. Bake for around 10 minutes, until they’re lightly browned, and let cool on the tray for a minute or so before you transfer them to a wire rack. 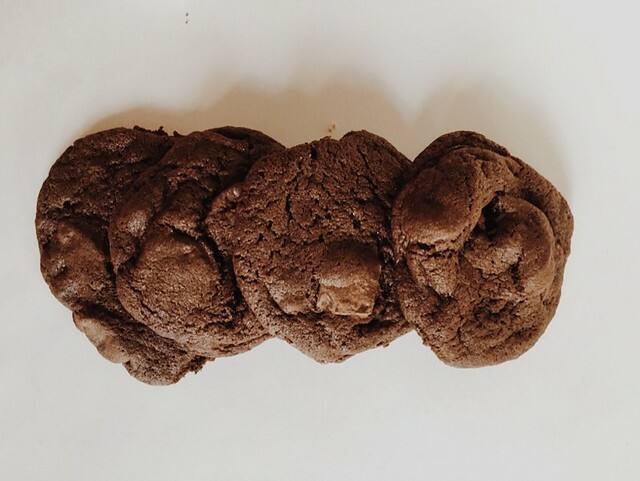 I found this recipe at the always inventive Baking Bites – I’ve never had a failure with her cookie and cupcake recipes, and as she described, these cookies were moist and slightly chewy without being cakey or overly dense. I’d never actually used pumpkin in a sweet baking recipe before – it’s more of an American cooking quirk than an Australian one, although we do have pumpkin scones here in the Antipodes. I usually eat pumpkin in salads, and when I read this recipe I had just roasted some small pieces of pumpkin, skin on, to have for lunch during the week. I simply scraped a cup full of the soft pumpkin from the skin, and used that pumpkin in this recipe – I think the roasting gave it the biscuits a bit of extra warmth. I didn’t use the optional nuts mentioned by Baking Bites as I didn’t have any in the cupboard, but I think they’d give a nice crunch to these soft biscuits. Preheat the oven to 180C. Line your baking trays with baking paper, to prevent the biscuits sticking. Sift or stir together the flour, baking powder, baking soda, salt and spices in a bowl. In a large bowl, cream together (either with an electric beater or by hand) the butter and sugar. Beat in the egg, vanilla, and lastly the pumpkin. Add the flour mixture and stir in by hand until just incorporated. Stir in the chocolate chips. Drop tablespoonfulls of the biscuit mixture onto your baking trays, and baking for 12-14 minutes at 180C until slightly browned at the edges. Don’t worry if they’re a little soft – they will continue to cook and firm up as they cool on the tray. Well, these were a bit of a failure. If you take a look at Domestic Goddess (where I found the recipe), you’ll see what I was aiming for. Unfortunately, I decided not to bother with all that waiting around for butter to soften, and used a soft butter spread instead. Whoops. I think this was the reason my fingers didn’t hold their shape and instead spread into flat monster-like fingers, rather than the creepily-realistic versions I was aiming for. In a food processor, beat the butter until smooth and creamy. Add the sugars, egg and vanilla and mix well. Add the flours, baking powder and salt and beat until completely mixed. Cover and refrigerate for 30 minutes. 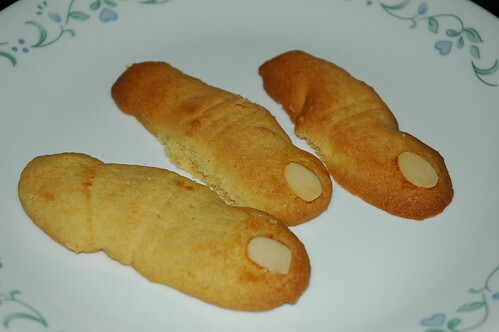 Preheat oven to 160C/325 F. Roll about a tablespoon of dough between your hands to form a finger shape for each cookie, leaving a larger rounded section in the middle for the knuckle. As the dough warms up and becomes softer, this becomes more difficult, so perhaps leave half the dough in the fridge while you make fingers out of the other half. Place the fingers on a tray about an inch apart. Slightly flatten the front of each finger to create a nailbed, and brush it with a little egg white before pressing an almond slice into each one for the nail. With a small sharp knife, make three cuts in each knuckle for wrinkles. Bake for 20 minutes or until fingers are slightly golden, and place on a rack to cool. 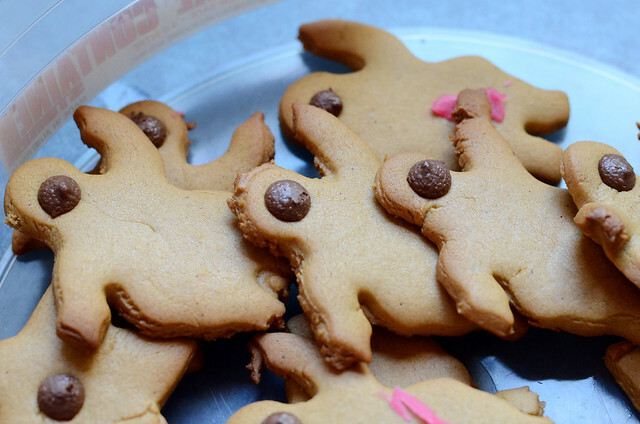 For a more gruesome version, you can attach the nails after the fingers are cooked with red icing, for that “I’ve been digging my way out of my grave” touch.